When Malaysia filed applications to the International Court of Justice (ICJ) last year over a 2008 ruling on Pedra Branca, Singapore's legal team took the unusual decision to deliver the knockout blow from the get-go. So, the strongest arguments were given in the written pleadings the legal eagles submitted first to counter the Malaysian requests for a revision and interpretation of the ICJ's judgment, said a new book documenting Singapore's approach to the cases. The authors wrote: "As our objective was to knock Malaysia's applications out at the very first instance, the Singapore team decided that we would include every single one of our strongest arguments in our written pleadings, instead of leaving them for the oral hearings." Starting in February last year, when Malaysia made the first of two applications, the Singapore team began to prepare intensively, the efforts of which would culminate in hearings at the ICJ, scheduled for June this year. An example of the attention to detail in the preparations was how meeting rooms were set up to partially resemble the layout of the ICJ courtroom in The Hague in the Netherlands. There, the team would rehearse their presentations, which were video-recorded for the speakers to study their delivery later. Playing the role of the Malaysian side was a group of lawyers from the Attorney-General's Chambers (AGC) who were not involved in the cases. Their goal was to identify the blind spots in Singapore's arguments. These and other behind-the-scenes details of how Singapore prepared for the cases are disclosed for the first time in the book Pedra Branca: Story Of The Unheard Cases. We were relieved but disappointed. We felt like a boxer who has trained for 15 months for a bout, only to be given a walkover. THE AUTHORS, who were involved in the case, on how the Singapore team received the news of Malaysia's withdrawal. Pedra Branca, meaning "white rock" in Portuguese, houses the Horsburgh Lighthouse and is about 40km east of Singapore's main island. It is strategically located, commanding the entrance to two shipping channels to the eastern part of the Strait of Singapore. Malaysia, which made its ICJ applications in February and June last year, withdrew both in May, just weeks before they were scheduled to be heard in court. 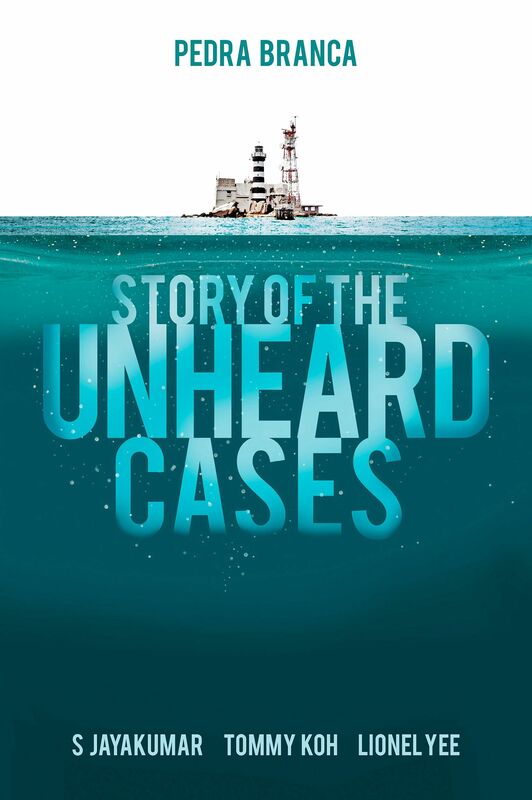 The book's authors - former senior minister S. Jayakumar, Ambassador-at-large Tommy Koh and Deputy Attorney-General Lionel Yee - were involved in these latest cases as well as the original Pedra Branca case, which went before the ICJ in 2007. The ICJ issued its judgment in 2008. Singapore was awarded sovereignty of Pedra Branca. Of the two neighbouring maritime features, Malaysia was given ownership of Middle Rocks while the South Ledge belonged to whoever owns the territorial waters it sits in. Last year, Malaysia revived the issue when it applied to the ICJ in February for a revision of the judgment, citing new documents it had discovered. The book's authors were former senior minister S. Jayakumar, Ambassador-at-large Tommy Koh and Deputy Attorney-General Lionel Yee. Four months later, it filed a separate application, asking the ICJ for an interpretation of the 2008 judgment, and to declare the waters around Pedra Branca to be Malaysia's. This would put the South Ledge in Malaysian hands. The book details how Singapore put together a multi-agency team and engaged international lawyers to help in the defence against Malaysia's new claims. Besides explaining Malaysia's applications, the book also delves into Singapore's arguments in its written pleadings. Singapore contended that Malaysia's "newly discovered documents" had nothing to do with sovereignty over Pedra Branca, and Malaysia's application did not meet all the required conditions, except one. In the interpretation case, Singapore countered, among other arguments, that Malaysia's request was without merit as it was asking the ICJ to decide on maritime delimitation, which it was not mandated to do. Prime Minister Lee Hsien Loong wrote in the 127-page book's foreword: "When Jayakumar told me that the authors were planning this book, I encouraged him. "This book describes how meticulously Singapore prepared for the two cases, leaving no stone unturned. Indeed, this must always be Singapore's approach." The Singapore team received the news of Malaysia's withdrawal with "mixed feelings", the authors said. "We were relieved but disappointed. We felt like a boxer who has trained for 15 months for a bout, only to be given a walkover." The preparations, however, were invaluable for a new generation of international lawyers in the AGC, and officers in other government agencies, the authors wrote. PM Lee also said in the foreword: "This book may be a slim volume, but it is a story of a small country mounting a huge effort to defend its national interests. It is a story worth telling, and worth reading." Pedra Branca: Story Of The Unheard Cases, is published by Straits Times Press and available in major bookstores and at www.stbooks.sg for $25 (with GST).